Portable Scissor Lift is ideal for transporting loads to and from work cells, where it can then be used as a work platform or raised and lowered to facilitate load transfer to tables or benches. Scissor Lift features ½" steel plate scissor legs, lifetime lubricated bearings and a hinged platform for convenient cylinder access. 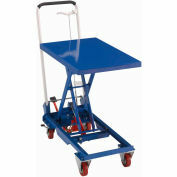 Rolls smoothly with 2 swivel, 2 rigid rubber casters; foot operated floor lock helps keep the unit in a fixed position. Durable orange powder coat finish. 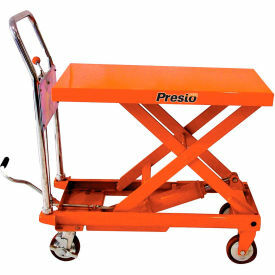 Manual Scissor Lift features a convenient foot pump for easy lifting.